Cameras, cameras, cameras....you never know when you may be on one or in a recorded news clip. Virginia Knightly was the only female news person in her office…an office that seemed to be falling apart. They needed a big story, and the new boss wasn't helping hold it together. Virginia got demoted, and then a new face appears. This new face takes the position of another of Virginia's friends on the news staff. All this is happening while a huge news story about the murder of a high profile lawyer is taking place. Everyone is fighting for news, and a lot of people including the police force, politicians, and even the press were not being up front and honest about everything. Meanwhile Virginia took on things she really shouldn't be doing alone. 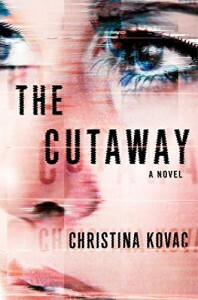 THE CUTAWAY takes us into the world of TV news bringing out all the hard work and investigation reporters and newscasters do. The characters are marvelous and so well developed that you can actually visualize them and consider them "real" people that you may even know. The story line held my interest and slowly but cleverly led you to the end along with many guesses as to who had "done it" without my actually guessing correctly.